On a recent Sunday evening Ilhan Omar’s campaign held a party to celebrate her primary win in August and the lead-up to the general election. Held at an East African restaurant in the heart of Minneapolis’ diverse East Lake Street, in many ways the gathering felt like a typical East African family party. The banquet hall was decked out with white tablecloths and blue ribbons — the colors of the Somali flag. Somali men waited outside the door jawing and catching up with friends and relatives. 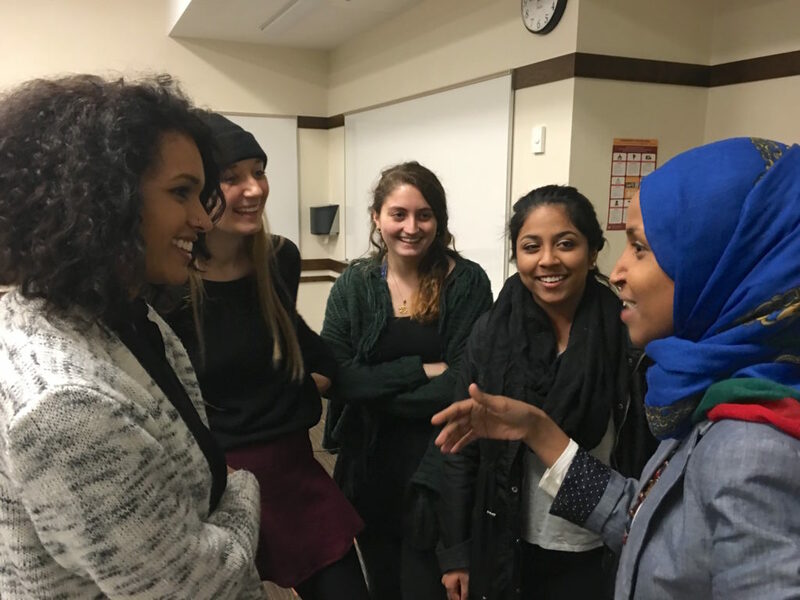 The crowd inside, a mix of students, older white liberals and members of local East African communities, was a cross-section of Omar’s supporters and the district she hopes to represent in the Minnesota State Legislature. Women looked elegant in their dresses. The men, young and old, were all in suits. Omar, like many of the young women there, had a creative and funky style. Her black and white patterned head-wrap matched a woven scarf hung over her shoulder and the long black beads draped around her neck. As the night went on the crowd swelled, the music blared, and the excitement in the room was palpable. Omar has a rock-star-like following here. She smiled and greeted people with warmth, taking selfies with friends and supporters while holding her youngest daughter. Omar’s primary win in Minnesota House District 60B was historic. She defeated incumbent Phyllis Kahn, who, after 44 years, is the longest-serving member of the Minnesota House. She is now poised to be the first Somali-American to be elected to a state legislature in the U.S. For young women of color her victory is huge. “This is someone who looks like me, who was from Somalia like me. 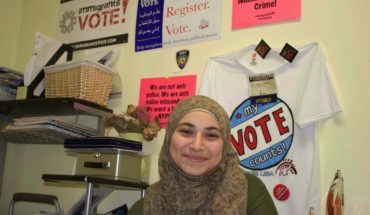 Someone who understands our needs, who understands our lives,” said Maymuna Sahal, a young Somali woman and a volunteer for Omar’s campaign from outside of her district. Omar, a 33-year-old mother of three, is the director of policy initiatives at Women Organizing Women. She has been active in Minneapolis progressive politics for years, having worked as a policy aide for Minneapolis City Council member Andrew Johnson and as a leader with the Minnesota Young Democratic-Farmer-Labor party (DFL), the liberal political party of Minnesota. 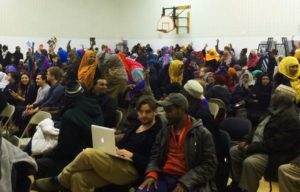 “Most of the time the politicians don’t live the experience of the people that they represent,” said Najat Hamza, a leader from the Oromo community – the second largest East African immigrant population in the Twin Cities of Minneapolis and St. Paul. “As an immigrant she understands our hurdles and our newly adapted American roots and values. So when she’s running, she’s not just running a platform to be elected, it’s also advocacy. If it was someone from a different background they can speak to you, but they can’t claim they have lived it and know what has worked and what hasn’t. They don’t carry that heart, that passion in a real sense,” Hamza added. 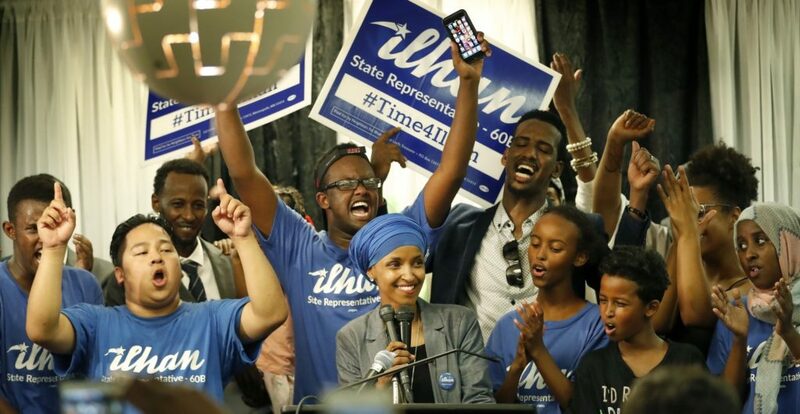 While Omar is familiar to Minnesotans who do organizing work in the Twin Cities, the movement behind her is refreshing to others, particularly in a presidential election season that’s been less-than-inspiring for many young people around the country. According to Joelle Stangler, the student body president at the University of Minnesota, students have been the backbone of the Omar campaign. 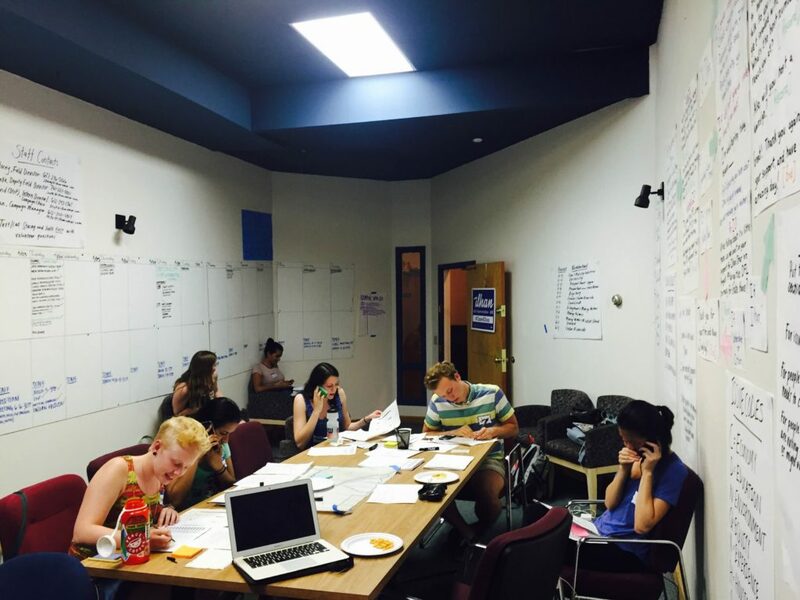 With the exception of East African volunteers, Stangler notes, the campaign has been primarily staffed by volunteers under the age of 25, many of them first-time voters. Omar’s platform focuses on economic, social, racial, and environmental justice. This includes reducing the income gap between white and African American families and hiring more teachers of color. She supports making higher education more affordable, addressing the threat of climate change, and divesting from fossil fuels. According to her supporters these issues have galvanized millennials, particularly millennials of color, to join her campaign. 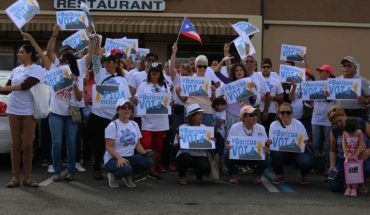 “She built her platform based on talking to hundreds of constituents in person, and hearing about what their concerns are. She represents issues that I am very committed to like education, criminal justice reform, police practice reform and support for new Americans,” said Bess Boever, a UMN law student and resident of District 60B. However, some are more critical. Abdulfatha Sameru, a young Oromo student at the University of Minnesota and a voter in Omar’s district, is a leader with Defend Glendale, a local affordable housing campaign. He thinks Omar could be more outspoken on this issue of preserving affordable housing. As candidates around the country scramble to compete in close races, Omar has the luxury of running virtually unopposed in the general election. Her Republican opponent Abdimalik Askar, also Somali-American, recently suspended his campaign in order to concentrate on his family and pursue higher education. Her real challenge was in August 2016 for the hotly contested race for the DNC primary. She was up against another Somali candidate Mohamud Noor and the incumbent Phyllis Kahn, a biophysicist renowned for being part of a group of feminists elected to the Minnesota Legislature in 1972. For Omar’s campaign, an unexpected hurdle appeared when she became the subject of a smear campaign following her primary victory. Some local media picked up allegations originally published in a right-wing blog that claimed she had lied about who she was married to. Her campaign later released a statement establishing that the allegations were false. Having won 41 percent of the vote in August and with a non-competitive GOP opponent, Omar is favored to be the winning candidate in the November general election. District 60B is a pretty and vibrant neighborhood. It includes a number of high-rises, single family homes and is known for it’s locally-owned restaurants and bars. If Omar is elected, she would represent a district with the largest population of East African immigrants as well as students in Minnesota, including those on three college campuses: The University of Minnesota (UMN), Augsburg College and the Minneapolis campus of St. Catherine University. Around 50 per cent of District 60B’s residents are between the ages of 18 to 24. Omar would be the first black Muslim woman elected to a state legislature in the U.S. For Omar, this political representation is crucial for immigrants and communities of color. “We wanted to make this election not about the individuals who were running, but about the urgency of having all of our voices heard and us making collective decisions about the future, about the prosperity and equality that matters to all of us,” Omar said. The Minnesota State Legislature is a predominantly male and white. More and more, though, Minnesota is not. Though the population of white residents currently hovers around 80%, according to 2010 U.S. Census data the non-white population of the state increased 227 per cent from 1990 to 2015. “For so long, people have concluded that [students and/or people of color] don’t really matter, that this process is too tough for us, and there is a certain channel that we are going to go through for us to matter. In this election cycle, and especially in my race, we were saying, ‘no, we control our narrative’ ”. Omar’s campaign chair David Gilbert-Pederson, a union and community organizer who has worked across the Midwest, says that Omar’s success in galvanizing a millennial movement in the Twin Cities comes from her work in building relationships with the community. Gilbert-Pederson says when she launching her campaign Omar focused on meeting people face-to-face. It was a meet-and-greet held just two blocks from his apartment that got the attention of Kanad Gupta. “It just made me feel personally like, we are young, but we have voices, we have the right to engage in the system and elicit change,” said Gupta, 22, a former computer science major at UMN. Gupta signed on to volunteer before the primary election and ended up developing two IT systems for the campaign to ‘get-out-the-vote’: The first created mass personalized text messages to the campaign’s volunteer lists, the second provided Election Day information to people who texted a specific number. 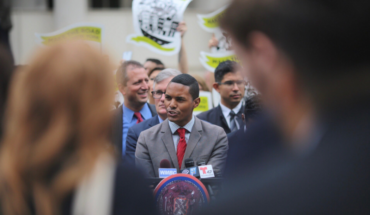 “The idea was basically to eliminate some of the hoops that voters have to jump through in order to find out how to vote, how to participate,” said Gupta. According to Omar, engaging millennials like Gupta in the political process is what is lacking in this election cycle. Controlling the narrative has never been more pertinent. Many in the community feel that the recent ISIS trials held in Minnesota for three young Somali men have given rise to stereotyping by the media and disproportionate surveillance by government counter- terrorism programs. Local youth recently led a protest against a new HBO series that has been described as a drama about jihadi recruitment set in Minnesota. “I think the campaign isn’t about countering stereotypes necessarily, but about being able to break through into a political realm that often pushes those people out, ” said Dua Saleh, a gender studies student at Augsburg College, who is from the local Sudanese community. “Seeing this black woman, who is an immigrant, who wears a hijab openly, who is publicly Muslim and publicly political, and willing to combat any patriarchal notions…is something that is phenomenal,” Saleh added. 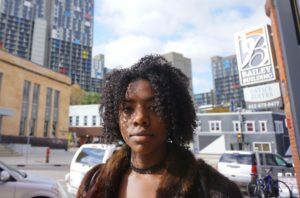 Stacey Rosana met Omar last November at the Minneapolis 4th Police Precinct occupation where Black Lives Matter demonstrations continued for 18 days after the police shooting of Jamar Clark. Rosana, a young East African is now Omar’s campaign field director. According to Andrew Aoki, chair of the political science department at Augsburg College, the election of immigrants and refugees is empowering for the communities they represent. “People feel more connection, they feel that the system—in a sense—includes them more, that there is more responsiveness. The other cases of this, where immigrants have been elected, seems to have had an energizing effect on other immigrants living in the area. It makes them feel more tied to the political process,” said Aoki. For Saleh, the gender studies student at Augsburg College, Omar presents a rare example of hope for young people.